The big question ahead of Bayern v Mainz was how would the Rekordmeister react to the midweek beating received by Liverpool? The answer was pretty straight forward. Within four minutes Robert Lewandowski, who had criticised Niko Kovač’s tactics after the Liverpool game, had scored with a close-range tap-in following a fantastic cross by David Alaba. Mainz struggled at this stage to keep a relentless Bayern side in check. The body language was all wrong and their positioning to timid to break forward and hurt a Bayern side that has been vulnerable at times this season. No surprise Bayern had further chances. In the 12′ minute, Kingsley Coman rattled one off the post from an impossible angle and James saw a shot from distance punted away by goalkeeper Florian Müller in the 14′ minute. And Mainz? The Karnevalsverein showed very little and only produced two half chances in the 23′ minute Levan Öztunali with a shot from the edge of the box and in the 24′ minute Manuel Neuer saw a pass inside the six-yard box blocked by Jean-Paul Boëtius blocked and had to scramble to make up for his mistake. Bayern, however, quickly put a cap on it in the 35′ minute. Joshua Kimmich played a ball from the right into the box where Leon Goretzka chested the ball to James and the Colombian hammered the ball home from 12 yards out. Three minutes later Kingsley Coman added another, the winger was given to much room on the left cut in on the edge of the box and hammered the ball home from 18-yards out. 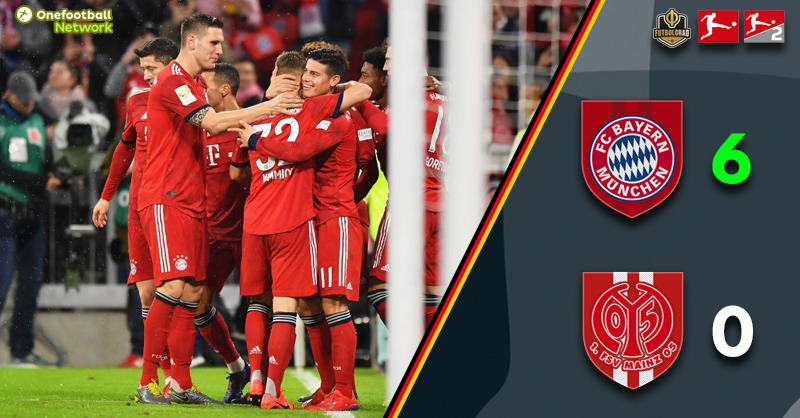 It was an easy first 45 minutes for Bayern and the Bavarians continued their onslaught to start the second half. In the 51′ minute, James was given to much space at the edge of the box, cut in and beat Müller with a wonderfully curled effort. The rest of the story is quickly told. Bayern were relentless against a Mainz side that never stood a chance. In the 55′ minute, James added his third goal making it 5-0 on the evening. From there on the game developed a friendly match atmosphere in which Kovač gave some playing time to young talent Alphonso Davies and also brought on Frank Ribéry for Coman. Davies then quickly got on the scoresheet putting away a Lewandowski rebound after Florian Müller failed to clear a close-range shot. It was the final highlight of a game in which Bayern were always completely in control. James Rodríguez has been a major discussion point in Munich. The Colombian has the support of CEO Karl-Heinz Rummenigge, who wants to trigger the €42 million buy-on clause and keep the playmaker in Munich. But Kovač is not that sure whether he is the player he needs for his plans. 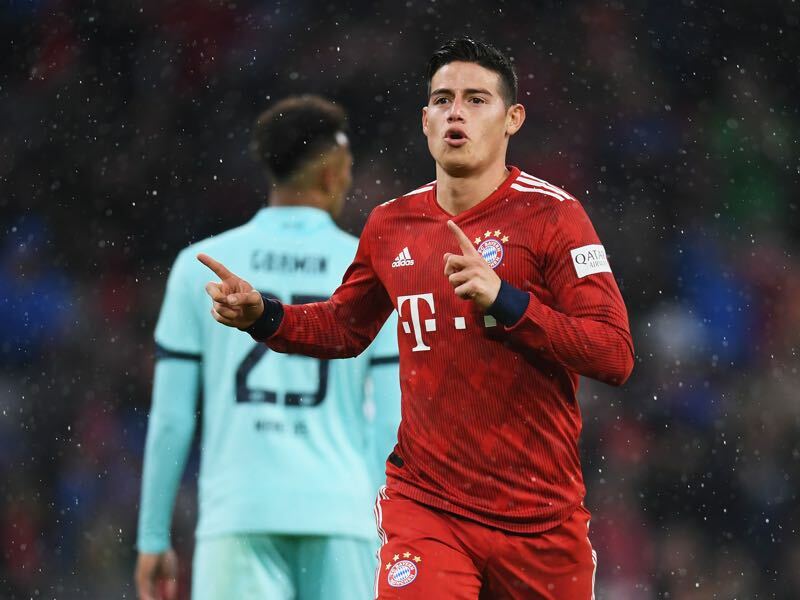 Fact is, however, that James has been excellent whenever on the pitch and his three goals today marked his first ever hattrick in the Bundesliga. Is the health of the league hurting Bayern? The Bundesliga saw all four teams go out of the Champions League ahead of the quarterfinals for the first time since 2006. Mainz’s performance, in fact, shows that to many teams are making it easy for Bayern, either due to lack of quality or wrong tactics. It is a concern going forward, both for Bayern but also for the overall health of the league. Alphonso Davies is the youngest Bayern goalscorer since Roque Santa Cruz in 1999. He also is the first player to score for Bayern born in the new millennial. James scored his first hattrick for Bayern, the last time he scored three goals in one match was for Porto against Vitoria Guimaraes in 2011. Leon Goretzka has now been directly involved in nine goals (six goals, three assists) in the 2018/19 Bundesliga campaign – new personal record.